The JBF DCM 600, DCM 800, DCM 1000, and DCM 2000 Shredding Systems are for the bulk destruction of sensitive information. High Performance Shredder and Pre-Shredders built individually to your specification for professional applications. Completely destroy from 650 to 2100kg of waste including metal ring files per hour depending on model. Price includes 4m Front Entry Automatic Conveyor System & Exit Conveyor. Paper is loaded onto an in feed conveyor which can be adapted to your exact requirements. This is transported to the strip cut pre-shredder for bulk reduction and then processed into a fine cross-cut shredder and exited to an exit conveyor system. Available as 90 degree angled or inline versions. Onward connection to integrated suction systems, conveyors and press containers are available on request. 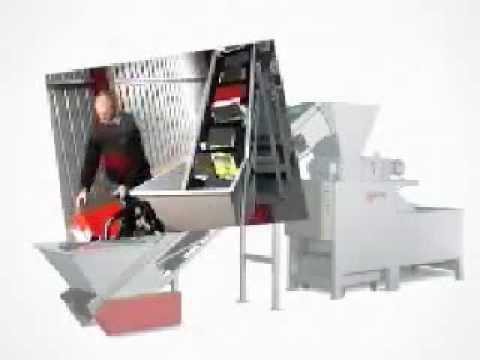 DCM Data Destruction Series Machines will automatically separate all Metal pieces prior to fine shredding.